Cyrus Joachim, also known as baby CJ among friends and family, is now four months old. I cannot believe it that time flies so fast. Wwooohoooo!!! His mommy gave birth to him four months ago. 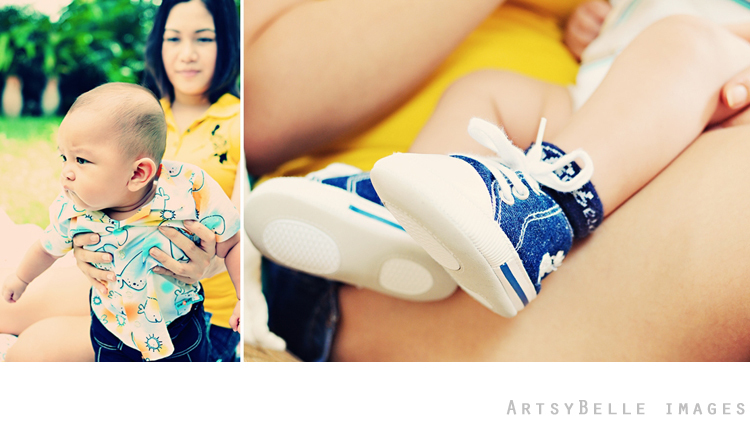 Four months had passed since he was christened and his birth was welcomed with great happiness. The first time I saw him, he could barely open his eyes and he just kept on sleeping. Now, he has better grasp on his surroundings. He now recognizes people and things, but he still needs support on sitting and standing. For sure a few months from now he will be one busy body doing all the crawling, grasping, etc. His mom is busy taking care of him that she sometimes does not have time to capture his moments. Documenting baby milestones are important especially before he turns one; thus, I'm glad to be again given the opportunity to take pictures of CJ at his very young age. The birthday of CJ's dad was coming up at the time we had the photo session; thus, we incorporated a family picture (because the dad is out of the country) and a birthday greeting as Catrina and CJ's gift. Aaawwww so sweet!!! Head on over at Facebook for more photos of this session. "Blue oblivion, largely lit, smiled and smiled at me." 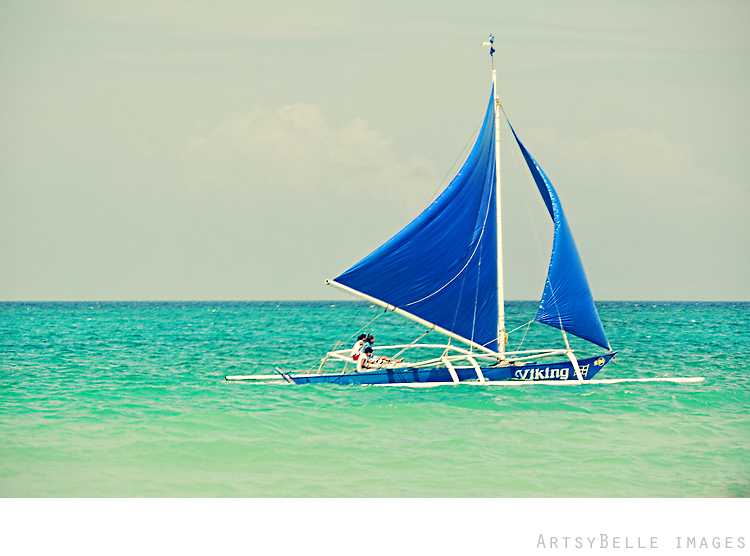 I went to Boracay a couple of weeks ago and I had a blast!!! Of course I brought along tons of memories and hundreds of photos that up until now am not done sorting. Oh life at the beach. Sigh!!! 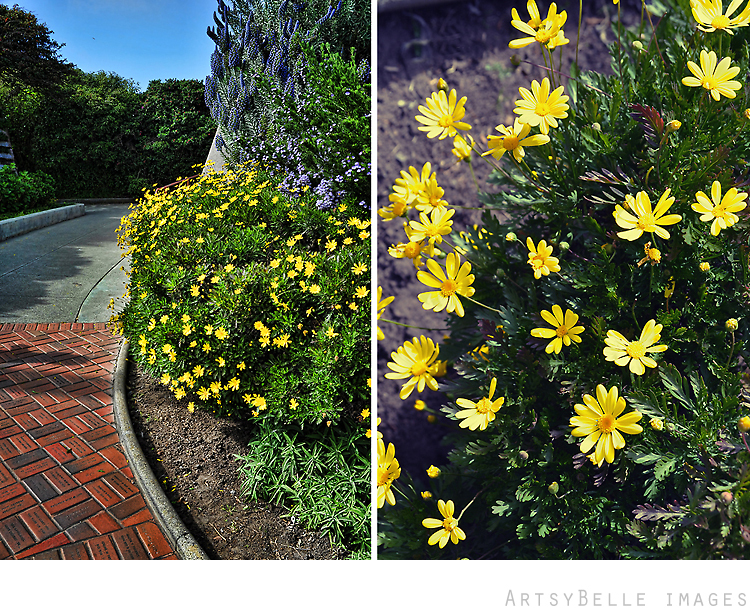 Everything just comes to life and vibrant colors are everywhere. 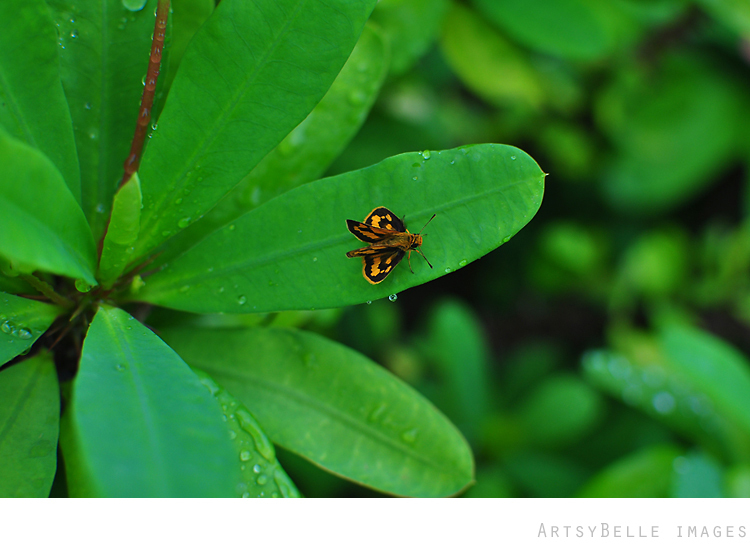 Below are a few things that caught my eye while strolling at the beach. 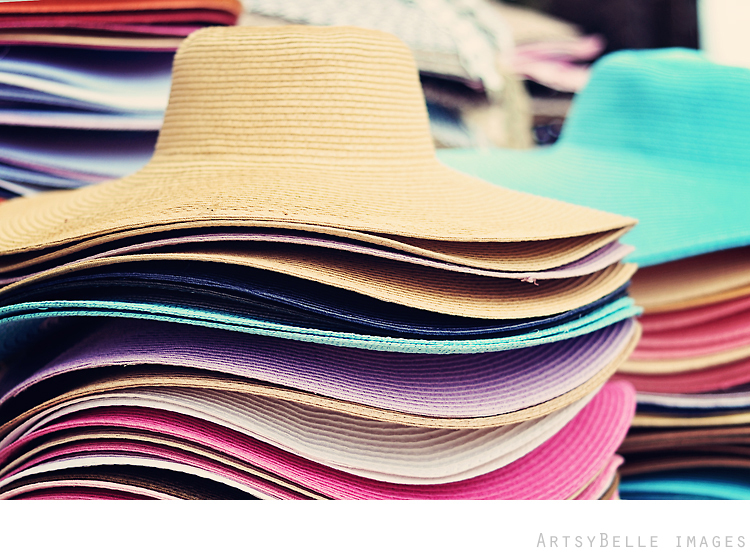 Don't get sun burn on your pretty face; be sure to grab a lovely straw hat from the street peddlers. 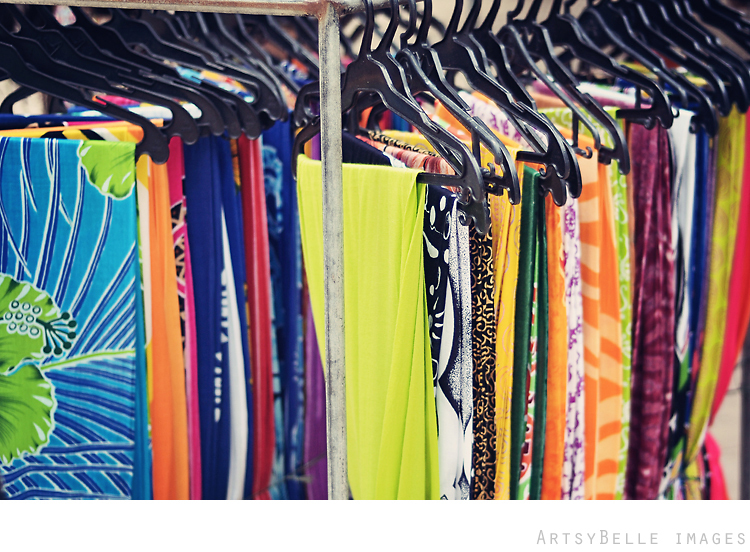 Colorful sarongs along the way; these are great swim wear cover ups, scarf to ward off the chilly nights, picnic cloth, and so many other great ways to use. 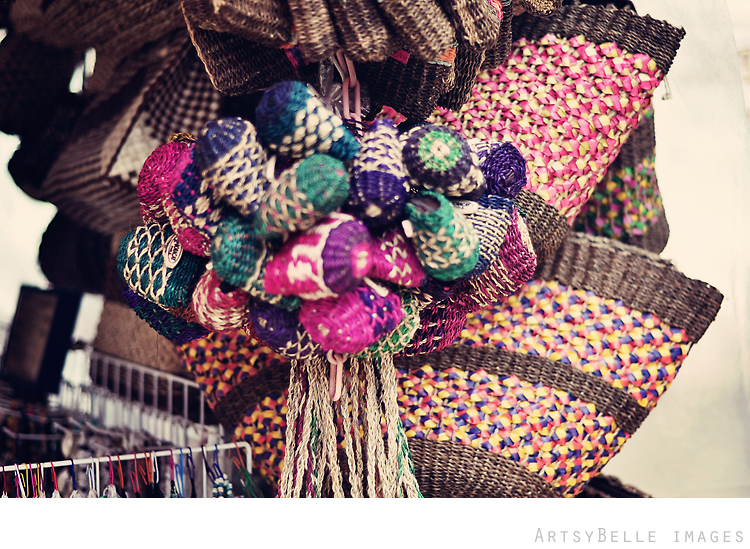 Purse made of local materials and these are hand made. They come in many sizes and various colors too. Ahhh seashell neck and arm candies. 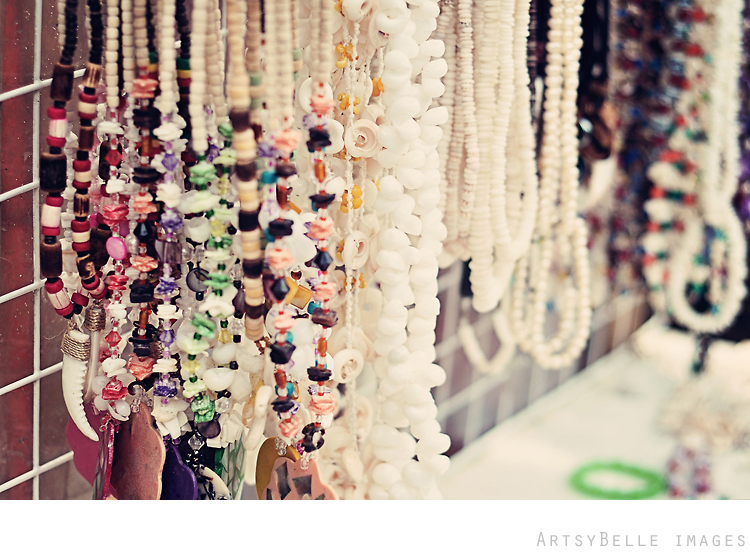 Lovely bracelets and necklaces are a staple for a fashionable you at the beach. Love looking at these cute basket magnets. 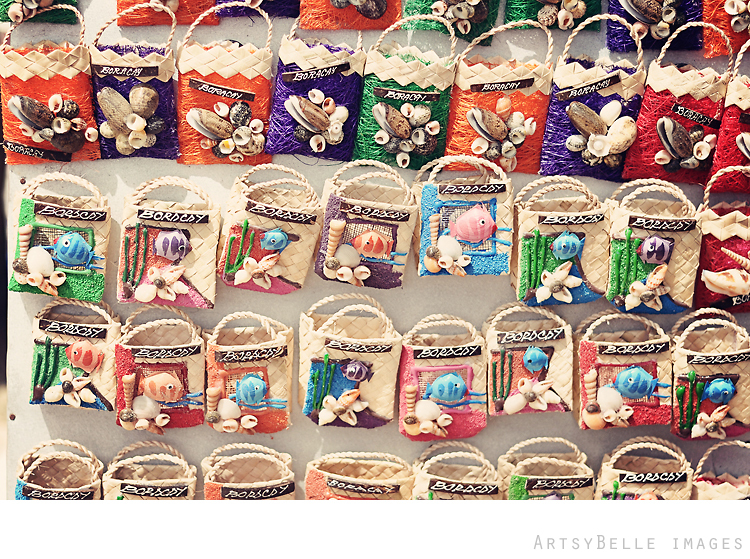 These are adorned with local materials and of course seashells. I think these are going to be great for holding small knick knacks. 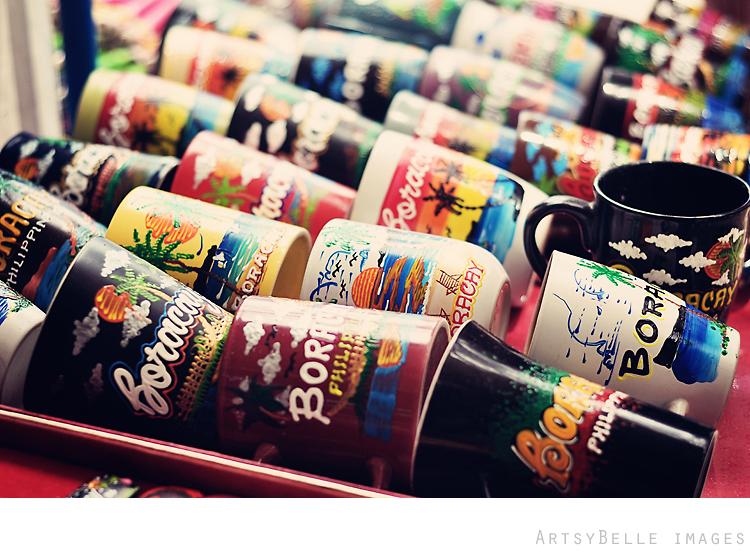 Mugs, mugs, and more mugs. There's so many of them that you will have a hard time selecting which one to take home. 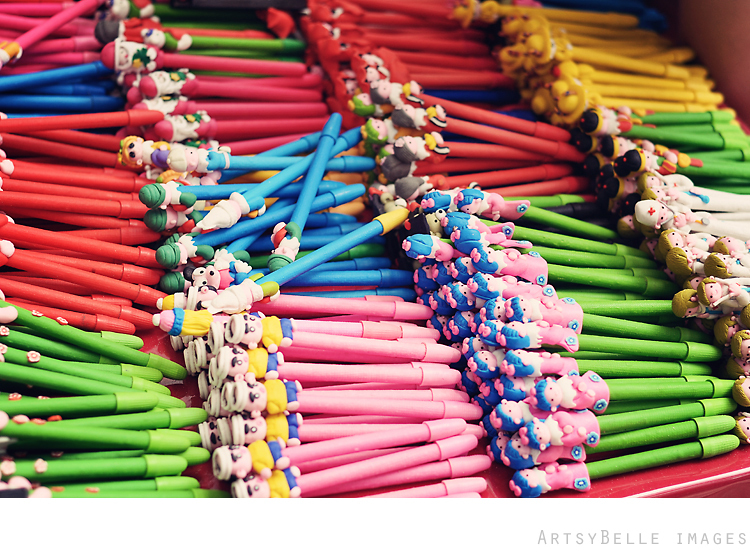 And lastly, these are cute and colorful pens. You can request the store artist to customize the pen by an art or letter painting. The days flew by so fast of which I sometimes did not know what day it was. Thanks to photos, I would have something to look back and recollect how I spent my days. Here was a week in random photos. 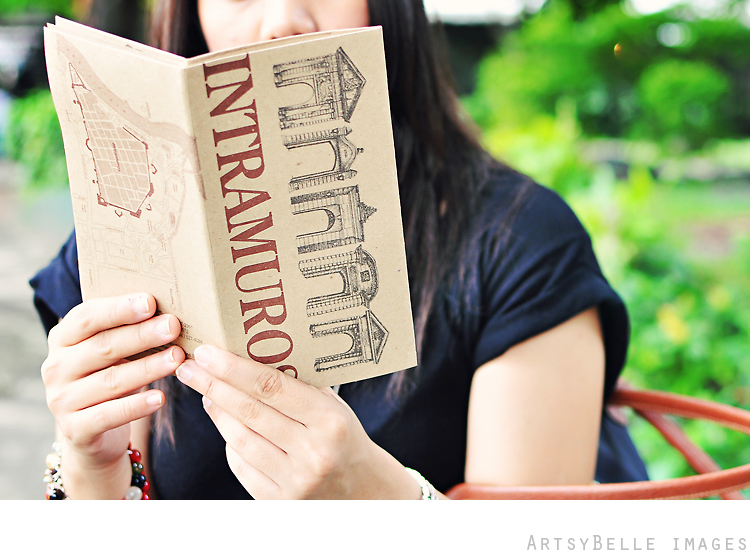 Reading the Intramuros map and its history. 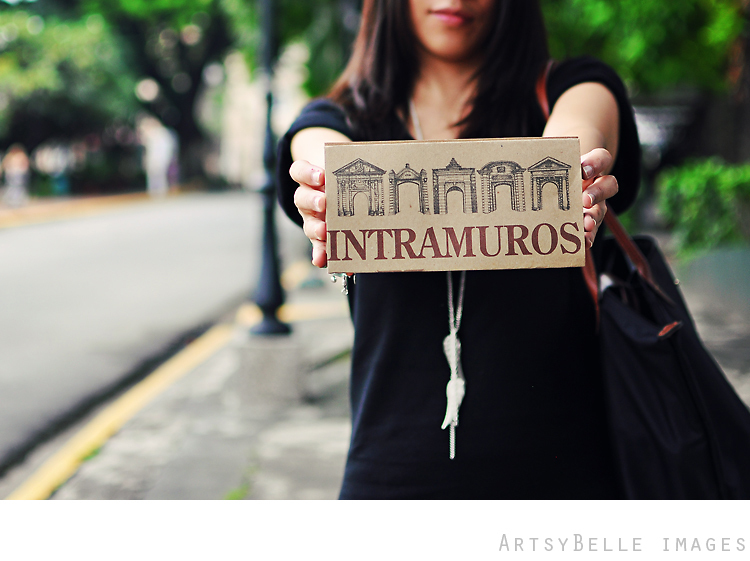 Intramuros, the walled city of the affluent Filipinos in Old Manila. 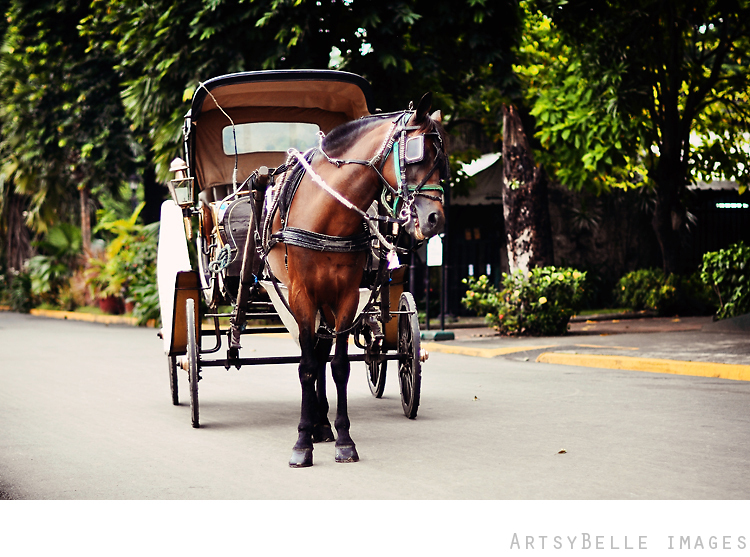 "Kalesa" was the primary mode of transportation in the 1800s. I noticed a small bee busy sucking a flower's nectar for his daily food. I can't leave a place without taking a flower shot. 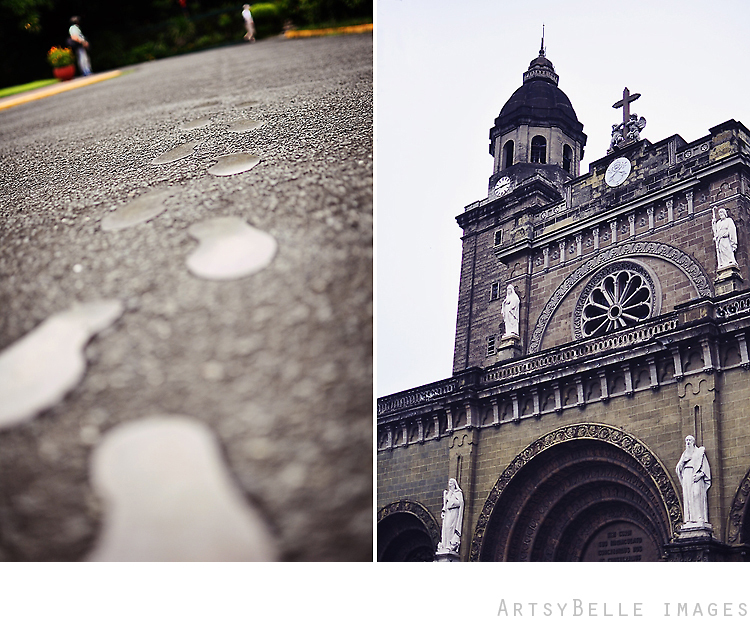 Steeled footprints inside the walled city and one of the oldest churches, Manila Cathedral. 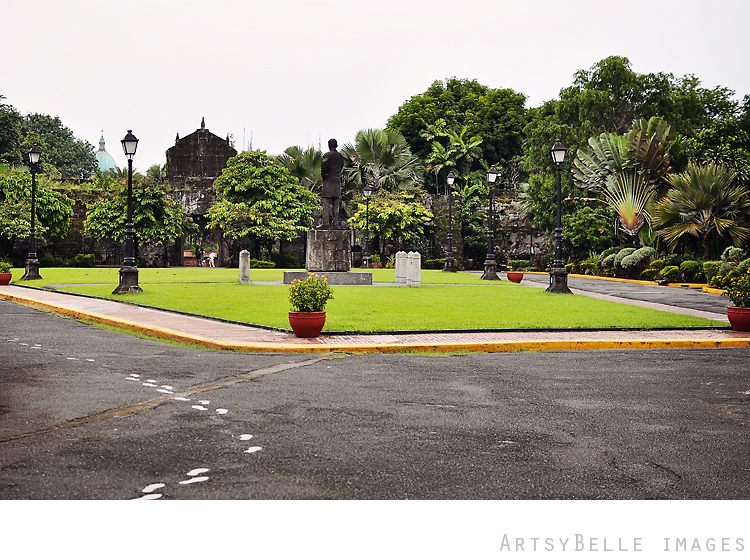 Rizal, the National Hero's, shrine. I went inside the museum, but didn't stay long because I found it creepy. I had goose bumps. 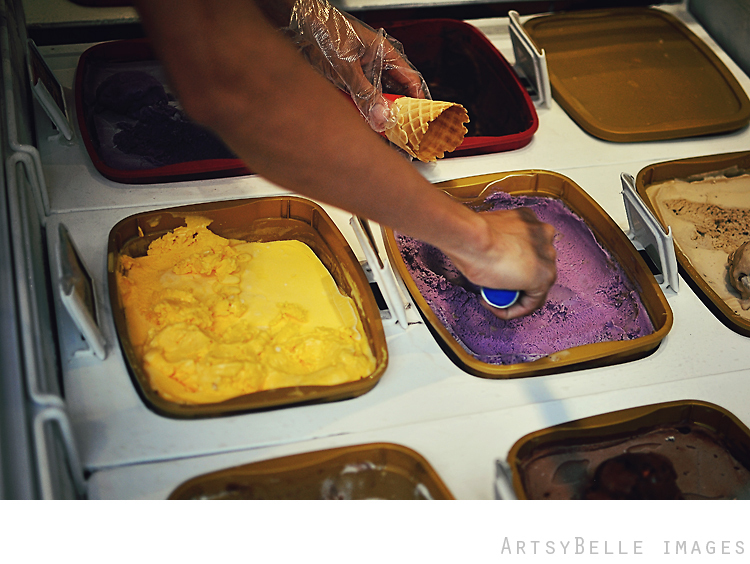 I craved for an ice cream despite the cold weather. 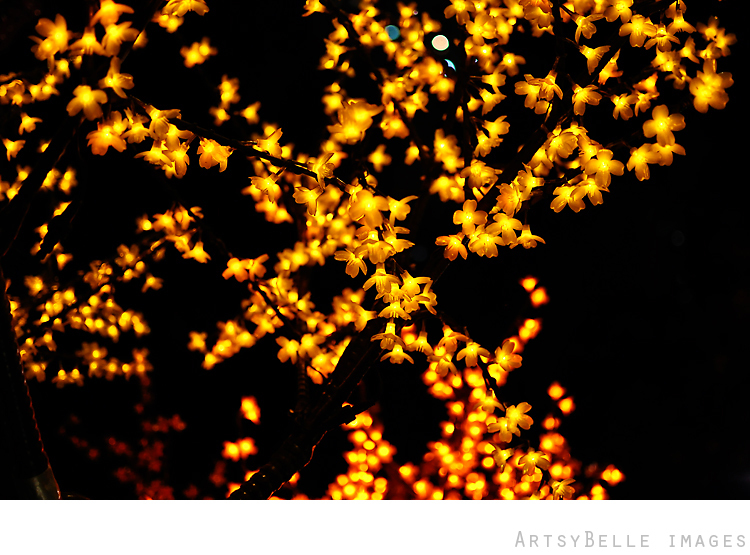 Stayed late into the evening at a mall that has artificial trees with brightly lit light bulbs as its leaves and flowers. and your form and colour are the way I love them." In your eyes of mourning the land of dreams begin." 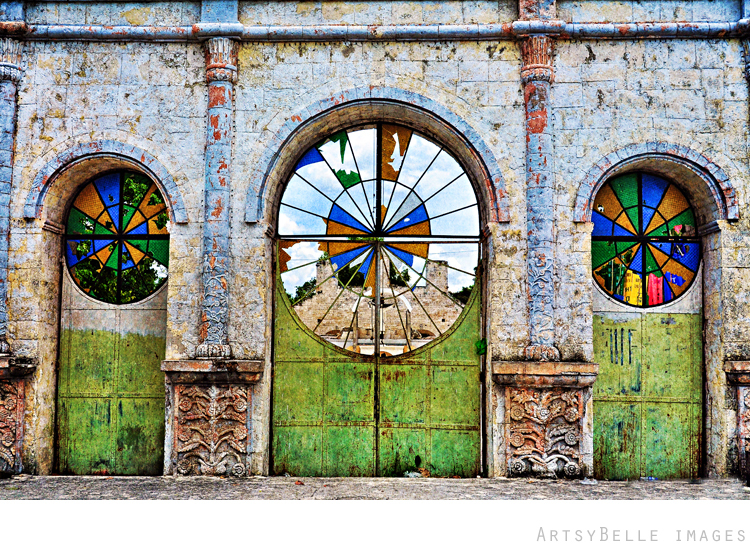 The joy of discovering and seeing new places in my travels has inspired me to take pictures. 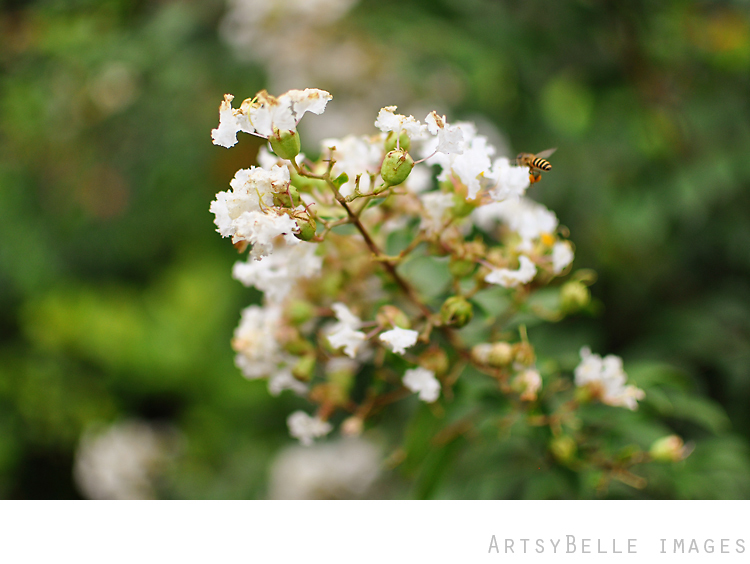 It is in my travels that I first got into photography. I like to travel, but if money and time does not permit, I can just watch a marathon of the Travel Channel shows especially that of Samantha Brown. How nice it will be to travel around the world and being paid for it? 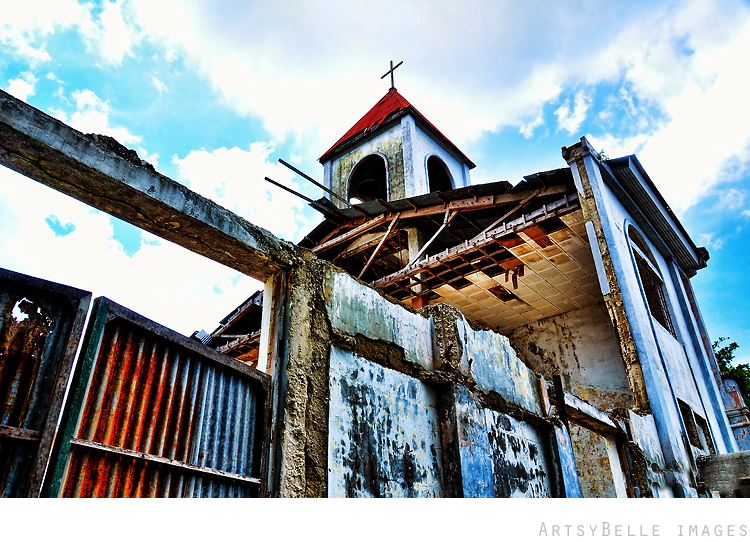 I was cleaning my hard drive when I realize that I still have travel photos I have tagged for posting...so here goes my take of the church ruins at Southern Cebu. 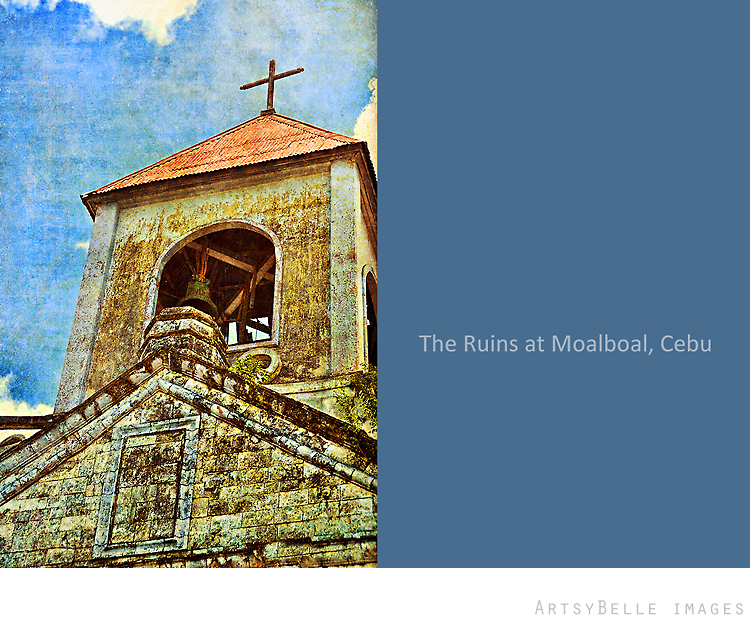 The church ruins used to be the San Juan Nepomuceno church in Moalboal. The old church was gutted with fire and only the church facade and the belfry was left after the incident. 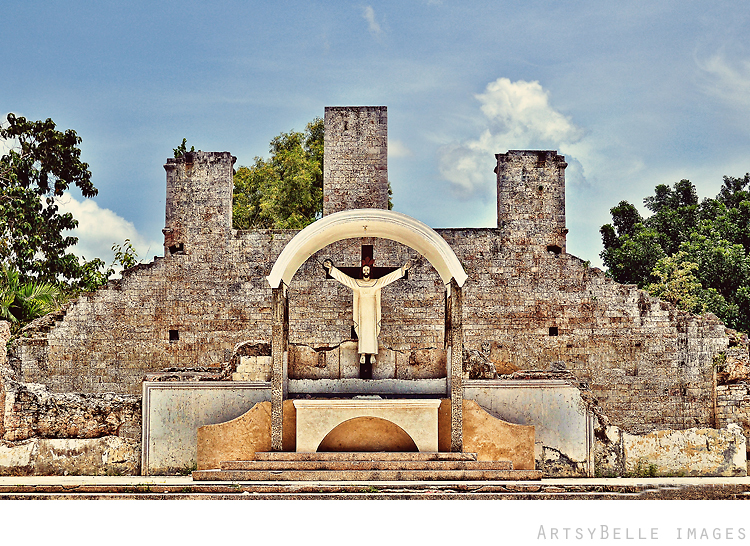 The altar was rebuilt, but the locals had built a new church at the adjacent property. "There is never enough time to do everything, but there is always enough time to do the most important thing." Oh no, I'm almost late for this weekly project. There are just so many things going on with my personal life right now that I barely have time to open my computer. I have so many photos waiting to be uploaded, but I'm always rushing out of the door and just head home enough to catch some sleep (the latter am exaggerating a bit, but what am experiencing now is not far from it). I hope to find order in my time real soon and a.s.a.p.!!! "At one glance, I love you with a thousand hearts." Love is what a mother feels from the time she conceives her baby and more so when she sees her baby for the first time. I am amazed at the bond between a mother a child and such is evident how a baby becomes when he/she grows up. 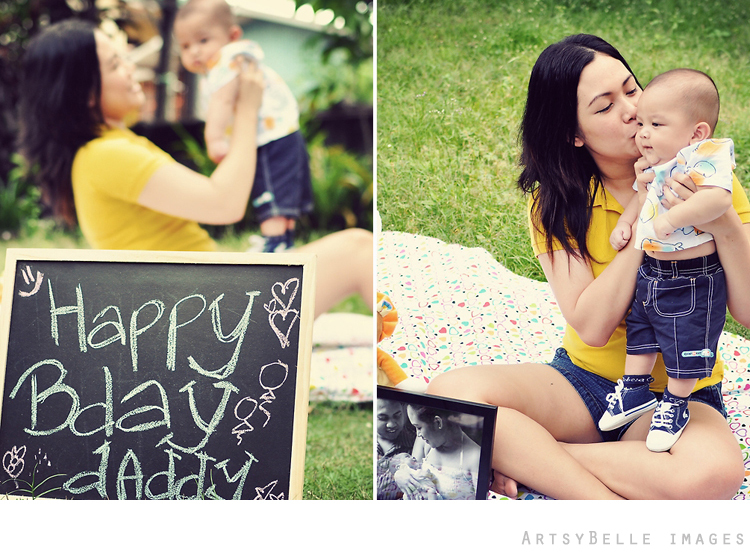 Baby milestones are important to a mother or to the family because they grow up so fast. 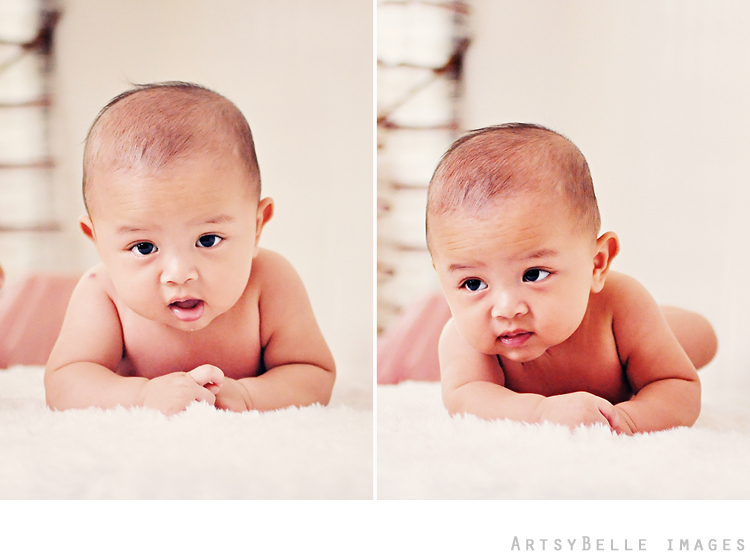 This is the case of baby CJ who was a her mommy's womb 4 months ago and now he's grown to be so cute and adorable. 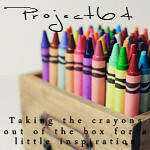 This is just a sneak peek, more to come soon. you seem to be as big as my palm or perhaps even smaller. I am curious at your appearance, you are a primate that is for sure but you have a long tail that reminds me of a rodent. I am wondering what you are thinking or feeling. 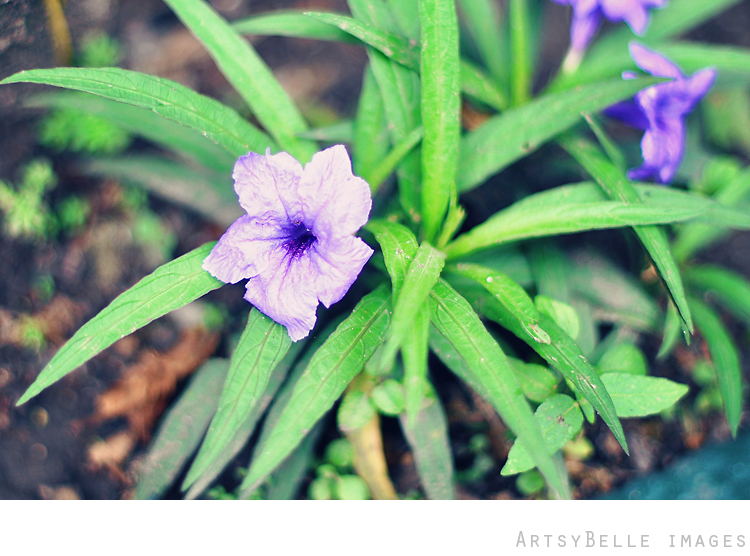 Do you wonder why people look at you with awe, amazement, or wonder? Are you bored? Are you hurt that you are in a contained environment and not in the wild? Do you miss your own kind? 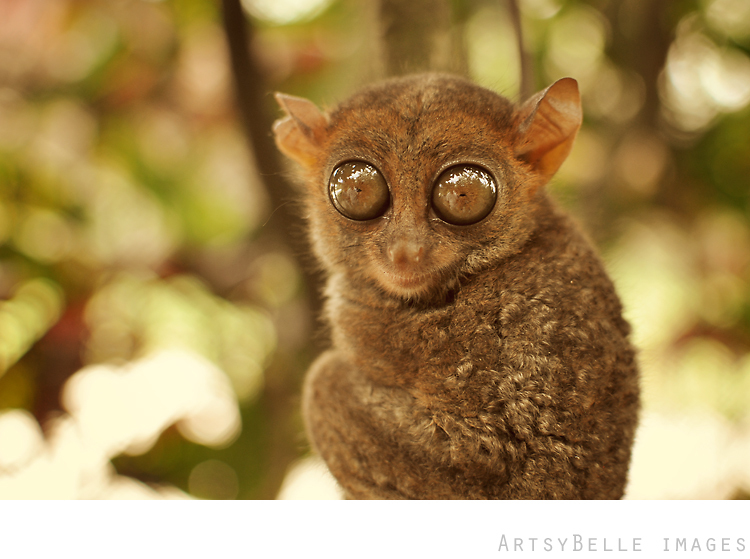 These are the thoughts and questions that goes on in my mind during a close encounter with a tarsier (the world's smallest monkey). In as much as I like to see them at close up, I feel a pang of guilt because some of them are exploited for tourist attraction. I'm glad that our government has taken conservation action for the species' survival. 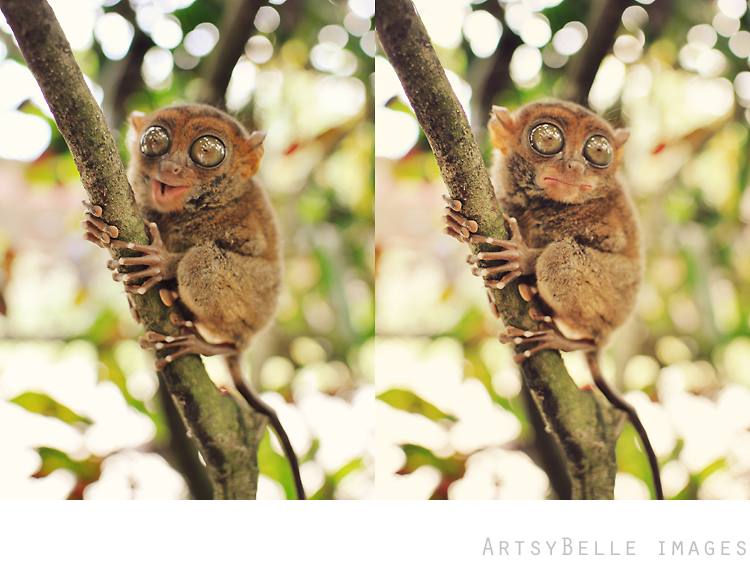 In fact, there are only a few tarsiers left in some Bohol tourist spots compared to years ago when these small primates are seen almost anywhere. I'm glad that I have a chance for another glimpse of this endangered specie and capture his expressions. When I first wrote about a simple guide on some of the places around or somewhere in San Francisco, Sonoma, Marin, and Napa of California, I didn't realize that there are a lot of places to enjoy in Northern California. It has become so long that I have to separate it into two parts. This is Part II of the mini guide. You can read here, Part I at Touring Northern California - A Mini Guide Part I.
California is at the Western end of the U.S.A continent; therefore, it is facing the Pacific Ocean. The California coastline offers a variety of coastal scape, beaches, and rock formations. Bodega Bay is situated in Northern California specifically at Sonoma County. It is a perfect place to just drive by and enjoy the ride along the sea coast. Of course, while you are already there, don't miss to check out the beaches, you will enjoy the sound of the waves and be amazed with the natural wonders. The Chinese are one of the earliest migrants in California. The Chinese are also known for their business acumen and very close knit community. Understandably, in every place that they migrated to, there will be Chinatown. Today, Chinatown in San Francisco is not any different from any other Chinatown. Business still thrives in this distinct community. The good thing with it is that you will really find good and inexpensive finds. If you are in a hunt for jewelries, they say that Chinatown offers a very good price. 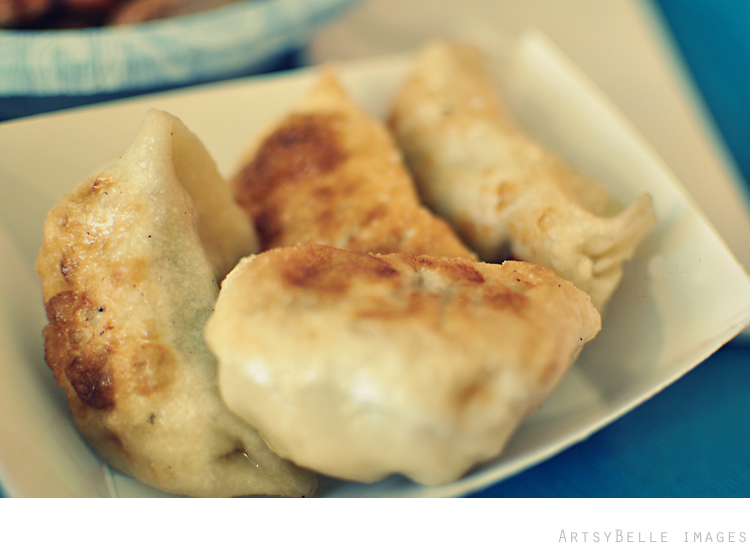 Of course, it's also an excellent place to try out dimsum and other authentic Oriental dishes. There are so many places left to be discovered by every visitor/tourist in SFO, especially at the downtown area. Shopping, dining, bar hopping, dancing, etc. are just a few of the activities when spending some time in SFO. Lombard, the famous crooked street, and Union Square are just a couple of the SFO landmarks that a visitor must experience. If you don't mind the many tourists or crowd; be sure to visit Pier 39. Your day will go by very quickly when you are at this place. There are so many things to do at this place. Enjoy the good food and get ready to be entertained the Pier 39 way. Summer with its warm weather and sunny skies is the best time to be out and about. It's also the great time for outdoor activities. Most counties have fairs or carnivals held on summer days. It's a unique experience and inexpensive to enjoy rides, games, shows, etc. Be sure to check out a fair schedule at the place nearest you. Napa and Sonoma are known for their world-class wines. Wine tasting, wine tours, and scenic drives are just a few of the things that you can do at the heart of wine production in California. 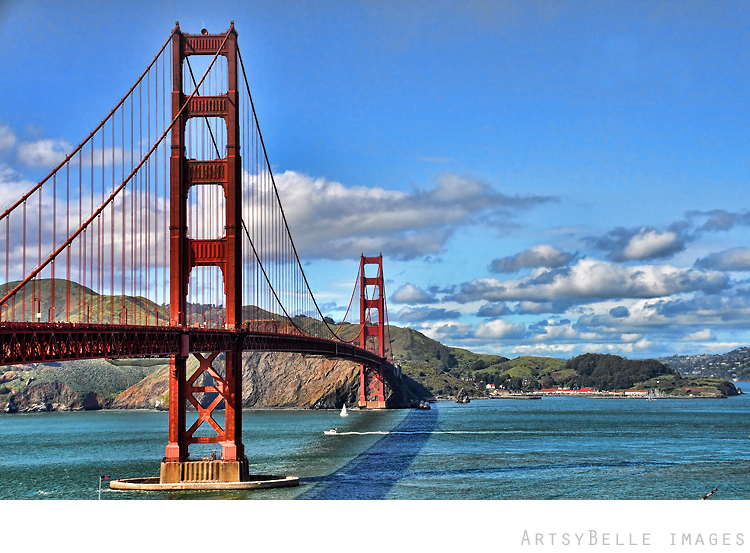 For a fun, eco-friendly, and inexpensive activity at the bay area be sure to check out the SFO Golden Gate Park. 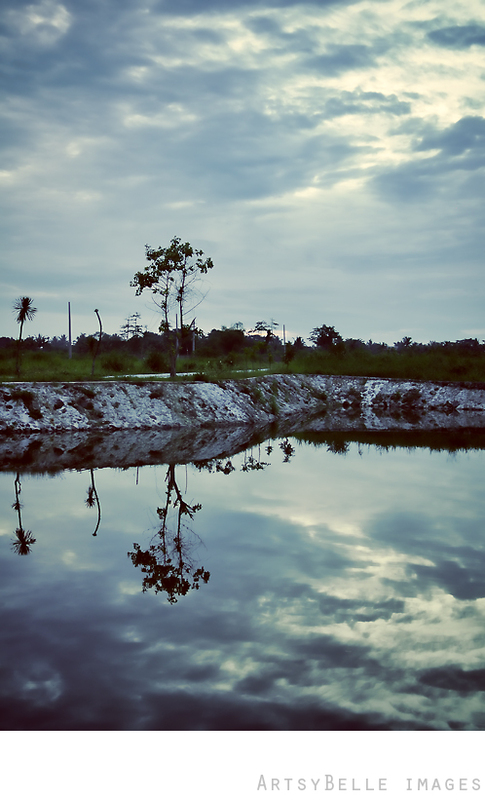 It's a huge park that is divided into several sections with various attractions. I highly recommend this place especially for first time visitors at SFO. Is the place if you are looking for a place with a great view of the Pacific Ocean. You can visit the place all year round with various activities and highlights each season. Point Reyes is also the best place for whale watching. Be sure to plan ahead your visit for an ultimate experience. After six months, I leave the place with an external drive full of photos and memories. I realize that there are still so many (sometimes unheard of) places to explore, which is a good thing if you prefer non-touristy locations.